There are nearly 5,800 railroad crossing accidents every year in the United States according to the U.S. Department of Transportation. 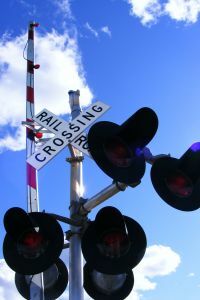 Boston car accident lawyers urge you to be alert at railroad crossings as crossing devices may fail, railroads may be littered with debris — mechanism failure or human error can cause fatal injuries. Avon officials were called to the scene of a Massachusetts car accident Thursday. An elderly woman and her car were stuck by a commuter train at a railroad crossing. The train engineer slammed on the brakes but was unable to stop before hitting her car. She was later pronounced dead. Crash Stuff reports that nearly 50 percent of collisions that take place at railroad crossings happen when warning devices, lights and gates, are activated. A study released by the Department of Transportation’s Federal Railroad Administration reveals that these railroad crossing accidents cause serious and fatal injuries to vehicle occupants because of the extensive amount of damage the massive trains are able to cause. Crash Stuff reports that a 150-car freight train that is traveling 50 miles per hour will take over a mile to stop completely. -Check both directions. If there are two train tracks at one crossing, one going each direction, be sure to look both ways before crossing. -Keep away. When stopping at a railroad crossing, make sure you are at least 15 feet from the tracks. -Assume there is always a train approaching. Approach all railroad crossings with caution. -Remember that the train is probably moving faster than you think. Trains often appear to be traveling slower than the eye perceives. A freight train tops out at approximately 60 mph while passenger trains can travel up to speeds of 80 mph. If you’ve been victim of a railroad crossing accident, contact our Boston injury lawyers at The Law Offices on Jeffrey S. Glassman for a free confidential consultation to discuss your rights. Call 877-617-5333 or contact us through the website.